Considering complex needs of industrial environments, industrial touch screen monitor should be selected carefully. While there are different varieties available in the market, their function and technological aspects varies. For instance, resistive touch screen monitors is one of touch screen variety and ideal for industries like food & beverage. This type of screen works by detecting change in electrical field and identifying touch point. Resistive Touch– This type of touchscreen is quite common and used widely for stability. One of the major benefits of a resistive touch is the low cost. A resistive touch panel includes multiple layers; there are atleast two thin transparent electrically-resistive layers separated by a thin space. This technology work well with stylus-like object and can be operated with gloved and bare fingers. Due to high resistance to liquids and contamination, resistive touch is ideal for use in factories, hospitals etc. Stylus Flexibility: Resistive touch-screen is able to register touch with any object, hence no special stylus to operate the screen. Less accidental touches: Unintended touches gestures are very common, since resistive touch screen does not pickup light touches chances of accidental touches are minimal. Cost Effective: Resistive touch-screen is priced reasonably(for now) and is a popular choice for end-users. High resistance: Resistive touch-screens are durable and have high resistance to dust and water. At Arista we manufacture waterproof LCD monitors for industrial processes and applications. Our resistive units meet NEMA 4X standards for the environmental exposure. To know about touch screen solutions click here. Projective Capacitive Touch: This technology is a variant of capacitive touch technology and made up of conductive materials layered on sheet of glass. This is an advance technology and delivers more accurate and flexible options. Projected capacitive touch-screen comes as self-capacitive and mutual capacitive. Self-capacitive touch-screen also known as single touch screen can resolve one touch point at a time. Mutual capacitive touch-screen is able to detect multiple simultaneous touch locations also known as multi-touch. 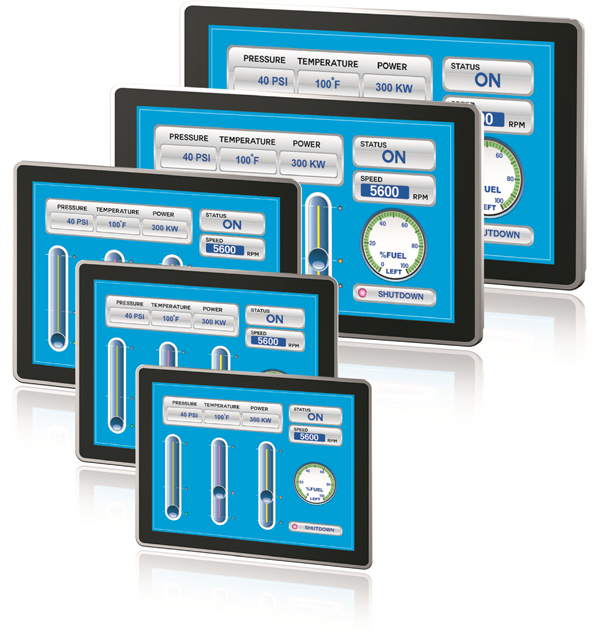 Industrial multi-touch series from Arista is great for a real time accurate display of information. The multi-touch TPC series provide ease of operation for complicated/harsh working environment needs. One of the panel PCs range is the ARP-3800AP-E01, this multi-touch panel PCs range embeds new dimensions for innovative HMI design and eliminates tedious tasks of navigating menu after menu of push buttons. Click here to know more. Require less pressure: Capacitive touchscreen require less pressure to operate and deliver instant and accurate output. High Image and durable: Projected capacitive offers best image quality and light transmissions. Moreover, these touchscreens are durable and able to withstand harsh work environment. Multi-touch support: Multi touch support is provided by projected capacitive touch screen, this provides additional functionalities like zoom in and out. Apart from features and benefits, touch screen panels or computers should also meet the compliance and regulatory guidelines of a particular work environment. Before settling for any touchscreen invest time in evaluating needs and nature of your product. For any questions regarding industrial display and computers, reach out sales team at sales@goarista.com or call toll free number 1-877-827-4782 Monday through Friday 8:00AM-5:00PM.